Following up from the Jobs & Growth report in 2015, SolarPower Europe has commissioned a new study assessing the socio-economic contribution of solar to jobs and value added in Europe for 2017 through to 2021. 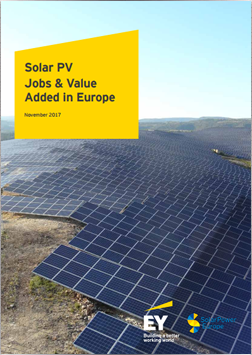 This study has been conducted by EY and notes the impressive contribution that solar is making to job and wealth creation in Europe today and in the future. Although the European Photovoltaic sector has been severely challenged in terms of installed capacities and turnover since 2011-2012, the sector continues to prove its socio-economic value in Europe, both in terms of job creation and Gross Value Added (GVA). Despite reductions in job and GVA creation, this trend is set to be reversed, with increased job creation and GVA in coming years. By 2021 it is expected to sustain nearly 175,000 FTEs and to generate nearly 9,500M euros GVA on a European level. Yearly installed capacities in the European countries have a significant impact on job and GVA creation, as there is a direct impact on manufacturing and services needed. With a RES target of 35% vs 27% job provision would increase by 56% (+120,000) in the solar industry alone. The removal of the anti-dumping measures that are currently in place would have a positive effect on employment throughout the value chain in Europe. In such a scenario, +45,500 additional jobs would be created in the EU28 by 2019. Rooftop PV installations support almost 3 times as many jobs and GVA than Ground-Mounted installations. This can mainly be explained by their installed capacities. Respectively 75% and 73% of the impact on jobs and GVA in 2016 is linked to the downstream activities of the PV value chain. Downstream activities of the PV value chain are more labor intensive than upstream activities. Particularly the sector of engineering, studies and administration provide the highest job support through to 2021.